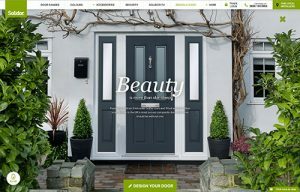 Solidor continue to build on what is widely accepted as the strongest consumer brand in the composite door sector, with a newly developed website that capitalises on the very latest digital technologies and thought processes. The website homepage has been completely transformed from a flat scrolling page to one that uses parallax scrolling, a new technology that takes a 2D image and adds an element of depth, thereby helping to create a new virtual experience. Solidor’s renowned consumer imagery is utilised to the full, while there is also an area where a typical Solidor door is exploded offering several hotspots which highlight key product features. 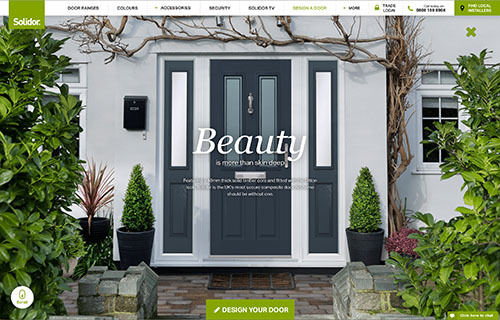 On the newly developed homepage are also options to change doors on a static image, along with details of the newly expanded colour range which includes lavender, cobalt blue and twilight grey. Scrolling further down the page are interactive and selection-driven sections for glass types and hardware, while security is highlighted with a section on the 3-Star Ultion cylinder, which is offered on all Solidor doors as standard.